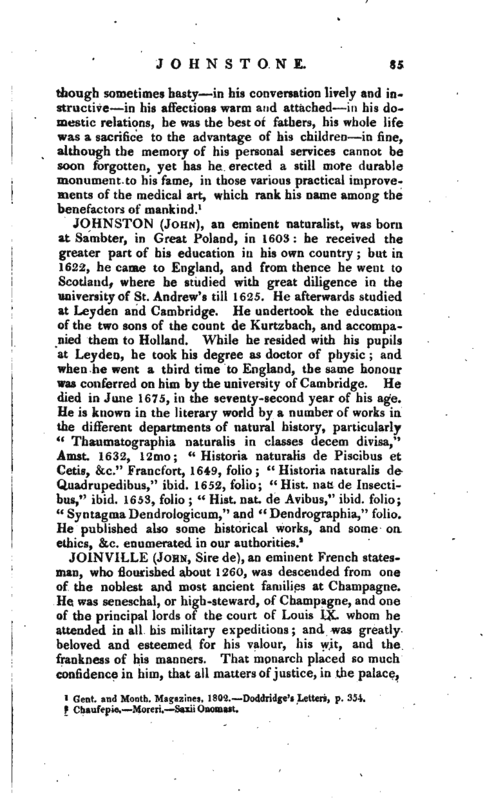 , an eminent physician at Worcester, was the fourth son of John Johnstone, esq. of | Galabank, one of the most ancient branches of the family of Johnstone of Johnstone: he was born at Annan in 1730, and received the rudiments of his classical education under the rev. Dr. Henry, author of the History of Great Britain. In the school of Edinburgh, under Whytt, Plummer, Monro, and Rutherford, he learned the science of medicine; and in Paris, under Ferrein and Rouelle, he studied anatomy and chemistry. In 1750, before he had completed twenty-one years, he took the degree of doctor of medicine, publishing a thesis “De Aeris factitii imperio in corpore humano,” which gained him much credit, and some valuable friends. The following year he seated himself at Kidderminster, in Worcestershire; which at that time, and some years afterwards, was subject to a putrid fever of such peculiar malignity, as to be called the Kidderminster fever. His name first became known by the successful treatment he adopted for the cure of this dreadful disorder. Instead of bleeding and purging, means then in common use, he recommended bark, wine, mineral acids, free ventilation of air, and the affusion of water and vinegar; and so prominent was his success, that he was immediately introduced into considerable practice. 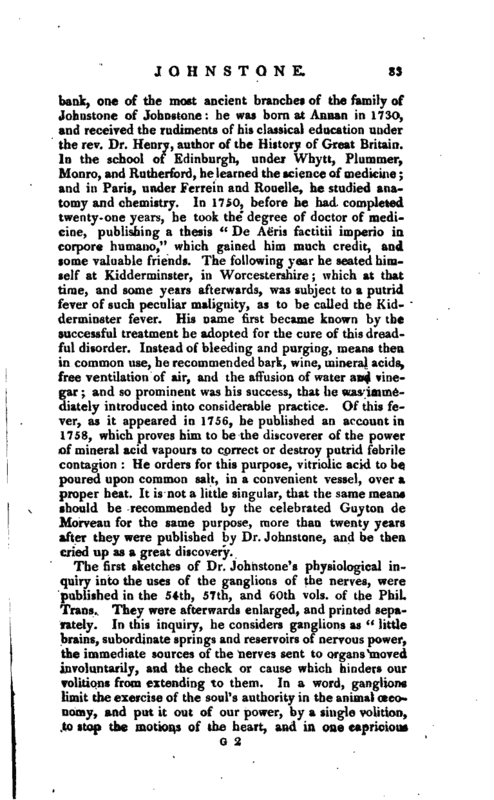 Of this fever, as it appeared in 1756, he published an account in 1758, which proves him to be the discoverer of the power of mineral acid vapours to correct or destroy putrid febrile contagion: He orders for this purpose, vitriolic acid to be poured upon common salt, in a convenient vessel, over a proper heat. It is not a little singular, that the same means should be recommended by the celebrated Guyton de Morveau for the same purpose, more than twenty years after they were published by Dr. Johnstone, and be then; cried up as a great discovery. The first sketches of Dr. Johnstone' s physiological inquiry into the uses of the ganglions of the nerves, were published in the 54th, 57th, and 60th vols. of the Phil, Trans. They were afterwards enlarged, and printed separately. In this inquiry, he considers ganglions as “little brains, subordinate springs and reservoirs of nervous power, the immediate sources of the nerves sent to organs moved involuntarily, and the check or cause which hinders our volitions from extending to them. In a word, ganglions limit the exercise of the sours authority in the animal ceconomy, and put it out of our power, by a single volition, to stop the motions of the heart, and in one capricious | moment irrecoverably to end our lives.” But his physiological researches did not stop here:^ In a treatise on the Walton water, which in quality strongly resembles the Cheltenham, he has pointed out the probable function of the lymphatic glands, supposing them to be organs destined to purify, digest, and animalize the matters selected and absorbed by the lacteals and other lymphatics; thus fitting them for their union with the blood, and the nutrition of the body. 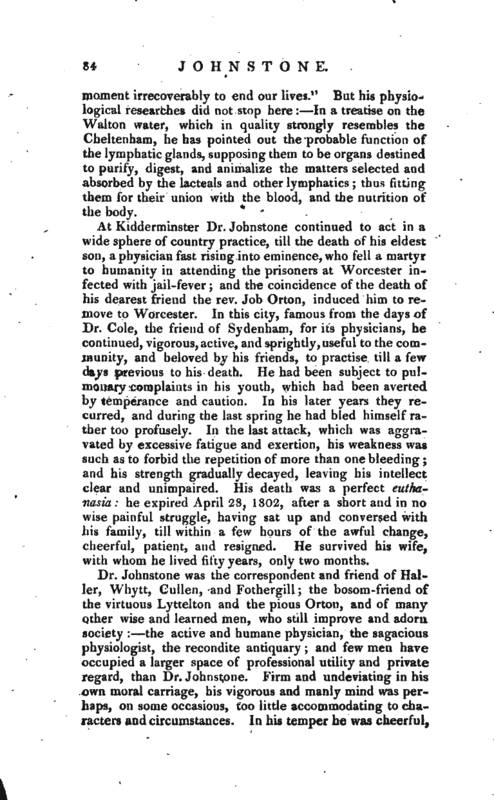 At Kidderminster Dr. Johnstone continued to act in a wide sphere of country practice, till the death of his eldest son, a physician fast rising into eminence, who fell a martyr to humanity in attending the prisoners at Worcester infected with jail-fever; and the coincidence of the death of his dearest friend the rev. Job Orton, induced him to remove to Worcester. In this city, famous from the days of Dr. Cole, the friend of Sydenham, for its physicians, he continued, vigorous, active, and sprightly, useful to the community, and beloved by his friends, to practise till a few days previous to his death. He had been subject to pulmonary complaints in his youth, which had been averted by temperance and caution. In his later years they recurred, and during the last spring he had bied himself rather too profusely. In the last attack, which was aggravated by excessive fatigue and exertion, his weakness was such as to forbid the repetition of more than one bleeding; and his strength gradually decayed, leaving his intellect clear and unimpaired. His death was a perfect euthanasia: he expired April 28, 1802, after a short and in no wise painful struggle, having sat up and conversed with his family, till within a few hours of the awful change, cheerful, patient, and resigned. He survived his wife, with whom he lived fifty years, only two months. Gent, and Month. 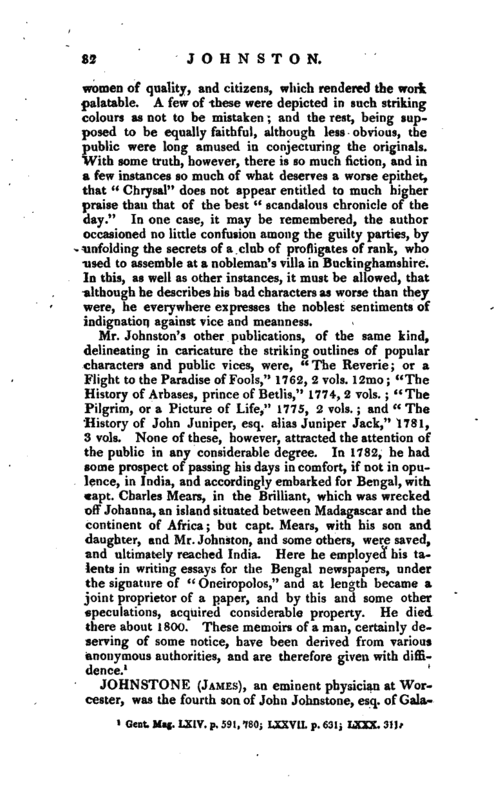 Magazines, 1802. Doddridge’s Letters, p, 354-.